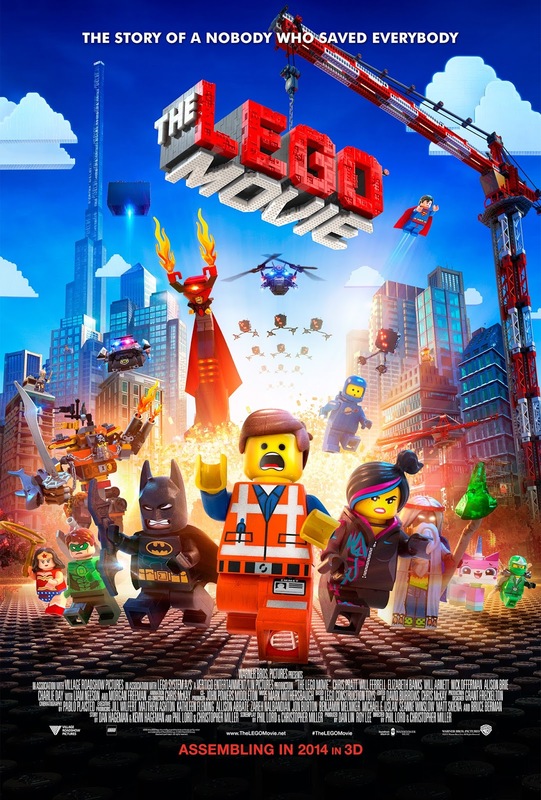 From day one hearing of The Lego Movie I was pretty excited; I love Lego, I love animated films, and perhaps most excitingly, the movie has been created by the people behind Cloudy with a Chance of Meatballs, one of the most visually rich, creative, and funny, animated films ever made. In those capable hands I felt sure The Lego Movie would be pretty great. Then trailers started to appear, I felt even more sure about it, seeing the attention to detail and fidelity of the on-screen Lego world only made me more excited. So when I came to actually see the film my expectations were pretty high, and yet it still managed to surpass them! To shoehorn in the film's theme-song, everything in The Lego Movie is AWESOME! The film shares the bright and wacky feel of Cloudy with a Chance of Meatballs. It also vaguely reminded me of Scott Pilgrim vs The World, not just for the clueless lead, and pink haired love interest, but the constantly changing settings and unreality of the universe. There are also some very pleasing flashes of Wes Anderson when you are pulled right out of the reality of the film to wide-shots of locations created at completely different scales, and with some silly "unrealistic" animations and sounds. The film is not afraid to poke fun at both the medium of Lego and its own choices of animation style. The world of The Lego Movie is staggering in its Legoness. Everything is Lego; cars, buildings, people of course, but then the sky, and sea, huge landscapes and tiny details. Even the explosions have been modelled as if they were meticulously crafted stop motion animations using real Lego pieces. While most of the film is CGI it's amazing to think that, with sufficient quantities of Lego and time, you probably could, with the exception of the facial animations, make it all as real stop motion animation. The film makers have made the decision to animate the film within the rules of Lego; if you couldn't achieve a design or movement with real Lego than it's not in the film, and that gives it a unique look and charm that sets it aside both from other animated movies, and from most of Lego's previous shorter CGI promo animations. We are also treated to whirl-wind tour of Lego worlds. If you're not that familiar with Lego then you'll just enjoy the random assortment of genre locations, but if you know your Lego stuff you're treated to a plethora of cameos and call backs. These worlds are also inhabited by a huge variety of characters that reflect many aspects of Lego: From the bright brick-built Unikitty in her equally bright and wacky Cloud Cuckoo Land, to the brilliantly retro spaceman Benny and his obsession with the Lego space-ship style of the past, and the most prominent (and scene stealing) licensed character in the film, Batman, who gloriously pokes fun at his own emo approach to life. Aside from being a beautiful homage to everything Lego the film is unrelentingly hilarious. Much of this comes from the animation style and limitations of the Lego world. My favourite jokes came from the film making, in particulr the manipulation of time; when the film skips forward with intertitles to denote the time passing. There's also the strength of the identity of each of the major characters, all offering different takes on identity, conformity (or lack there of), and how to exist in the Lego world. Their great variety, each offers something unique and positive to the Lego world, even the bad guy, all feeding into the film's message on creativity. If you're a fan of Lego you should love this film, it revels in its subject matter. It should also appeal to anyone interested in film making, particularly animation, as it's very cleverly and wittily made. And finally it's also one of the funniest films I can remember seeing, from what it gets from both the previous points, and so much more. I couldn't recommend The Lego Movie enough, it really is fantastic. I hope the franchise of Lego films to come after this can maintain the very high bar it has set.